Inspired to SleepTM is Advanced Home Care’s Extraordinary Care ProgramTM for sleep disorders. Download the Inspired to Sleep flyer. We begin the program by conducting a free screening for Obstructive Sleep Apnea (OSA). 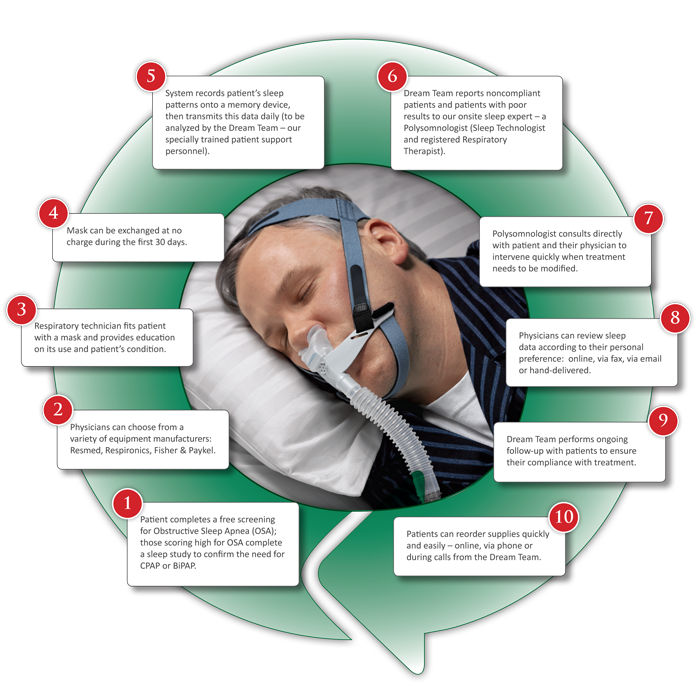 Patients who score high for OSA are asked to participate in a sleep study in order to identify whether they require a CPAP or BiPAP for their condition. We carry devices from a variety of equipment manufacturers, so our patients and physicians have multiple options from which to choose. Once the appropriate PAP device has been selected, an Advanced Home Care Respiratory Technician fits the patient with a mask and provides education on its use. Patients are also given helpful tips and educational information on their specific condition at this time. We are committed to fitting each patient’s mask properly to ensure a good night’s sleep while using the device. Our generous return policy allows patients to return their mask or exchange it for a new one within 30 days at no charge if they are not fully satisfied. REAL RESULTS: During a 3-month trial introduction of the Inspired to Sleep Program in the Blue Ridge, VA region, AHC’s patient compliance increased from 52% to 88%. Each night the patient uses the CPAP/BiPAP, the system records the individual’s sleep patterns onto a memory device and then transmits this information daily to members of Advanced Home Care’s Dream Team. Our specially trained support staff reviews this data in detail and reports any noncompliant patients, or patients with poor results, to our onsite sleep expert – a Polysomnologist (Sleep Technologist and registered Respiratory Therapist). The Polysomnologist reviews all data flagged by our Dream Team, and consults directly with each patient and his/her physician to intervene quickly when treatment needs to be modified. This sleep data can be shared with and reviewed by physicians on an ongoing basis, according to their personal preference: online, via fax, via email or hand-delivered. This innovative approach to collaborating with physicians and educating our patients on their condition allows for early intervention and improved patient outcomes. To support the continued treatment of each patient’s sleep disorder(s), our Dream Team performs ongoing follow-up with patients to ensure their compliance and progress in the program. Patients are able to reorder their supplies quickly and easily during these follow-up calls with members of our Dream Team, or online using our PAP Reorder Application. Advanced Home Care has many retail stores located throughout NC, SC, TN and VA, from which these supplies can also be ordered. To locate a retail store near you, please refer to our service area map.